KITsubs: Kamen Rider Stronger episode 39 - Final Episode Released! Kamen Rider Stronger episode 39 - Final Episode Released! The end of an era, as well as the end of a legendary series! The Delza army is on their last legs... but they still have an ace in the hole. The Kamen Rider family may be large, and powerful, but there's one member they can use to gain the upper hand. The one member of the Kamen Rider family whose heart is stronger than his body... Tobei Tachibana! As the battle draws to a close, an incessant evil long thought dead reappears... the mastermind behind the very same evil that the Kamen Riders are sworn to protect! In many ways, it makes sense that Tachibana would be the focus of this episode. He was always the father figure to the Showa Riders. A recurring character, but also a common human element that many of the modern shows lack. He was their friend, their mentor, and their ally. Fighting side by side with the Riders on many occasions, and helping to train them. He was a constant for the audience, even when things got bad. And when he was in danger, we felt it. This episode is the final appearance of Tobei Tachibana, played by Shoji (Akiji) Kobayashi. He was always a fan of the series, but after his time on Stronger he felt it was best for himself to move on. He was actually offered the role that would later become Tani in Skyrider, but turned it down. "In many ways, my heart was always with the original team. Tobei's story was over." Upon his passing in 1996, many Rider alumni attended his funeral. At the service, actor Hiroshi Miyauchi (Shiro Kazami) said "(Shoji Kobayashi) is still alive, and always will be in our hearts." Using the same term of affection for Mr. Kobayashi that the Rider cast uses for Tachibana... Oyassan, or Pops as we translate it. He said similar of series Creator Shotaro Ishinomori at his funeral. Years later, in 2005, Miyauchi would play the part of Tobei Tachibana in Kamen Rider The First, a remake of the original series. What else can we say. Stronger is a legendary series for a reason. Its got drama, tension, a solid second act twist, and the final episodes ramp up to an amazing crossover. A true finale, in many ways. Sure, Skyrider and Super-1 will always be part of the Showa era. But they were never part of the original story, bookended by Tobei Tachibana's mentorship and friendship with the Riders. And neither they, nor Black/RX and the movie Riders ever got to be part of a team... the Magnificent Seven Riders! Over the next few weeks we will be correcting the scripts for the old MCS releases of Stronger 2-20, and we will be releasing a batch torrent of the whole series. Until then, thanks for watching! Come back soon for another episode of our first dedicated series... Kamen Rider Skyrider! Thank you for your hard work on this! It's been an amazing series, and I always look forward to your work. Great job! I've been waiting for this for a very long time. Aren't you gonna post this on /m/? How's ep 42 of the original Kamen Rider TV series coming along? Congratulations! You guys did a great job with Stronger. 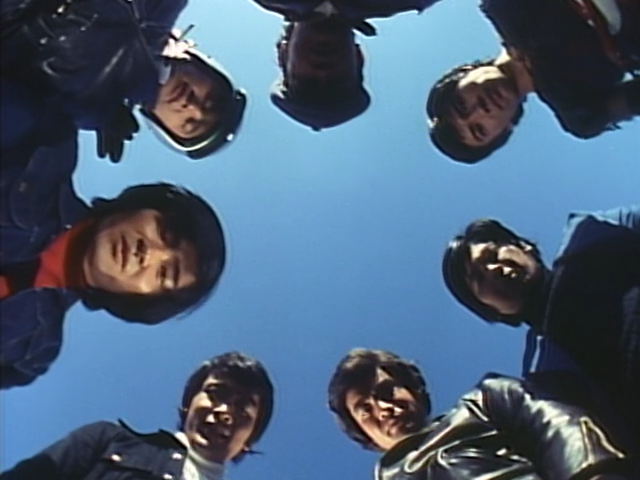 We are looking forward to the other showa riders now. Keep up the awesome work! Thank you for all your hard work on Kamen Rider Stronger! What's the point in posting new episodes , if the old ones are no link ? Yes please!! Re upload the old episodes!! Hi, guys! Thank you so much for subbing such a great series! Will it be possible, in the future, to have a batch torrent o f the whole series? All the old links are dead or the torrents unseeded. Thank you so much in advance!